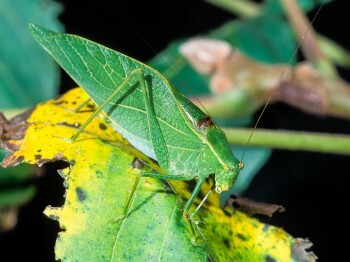 Ranging in color from bright yellow-green to deep leaf green, the false katydids are well camouflaged when perched on the leaves of trees, shrubs, and tall weeds. 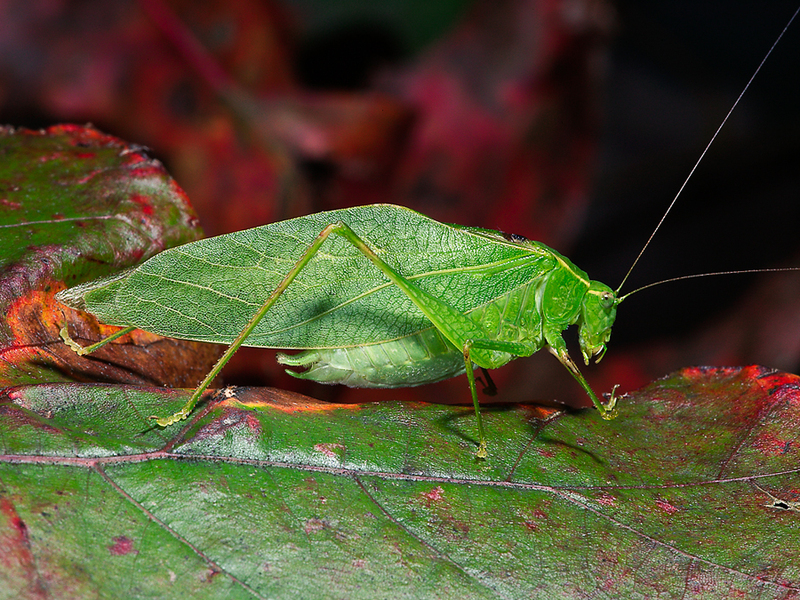 There is really nothing overtly “false” about this diverse group — entomologists simply refer to them this way in order to distinguish them from the true katydids, which belong to a different taxon. 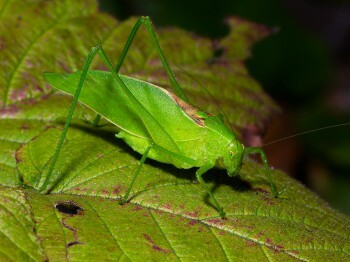 There are about sixty-five species of false katydids in North America, represented by twelve genera. Many of these are western species, and a number have very limited distributions. 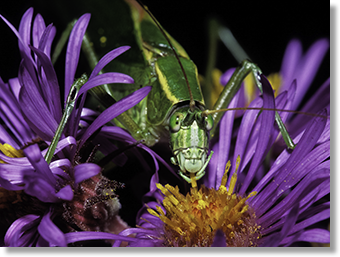 In this guide, we feature twelve species in three genera and include nearly all the common and widespread species in the East. 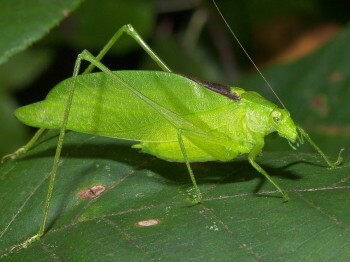 The three groups covered are the round-headed katydids (genus Amblycorypha), the angle-wings (genus Microcentrum), and the bush katydids (genus Scudderia). 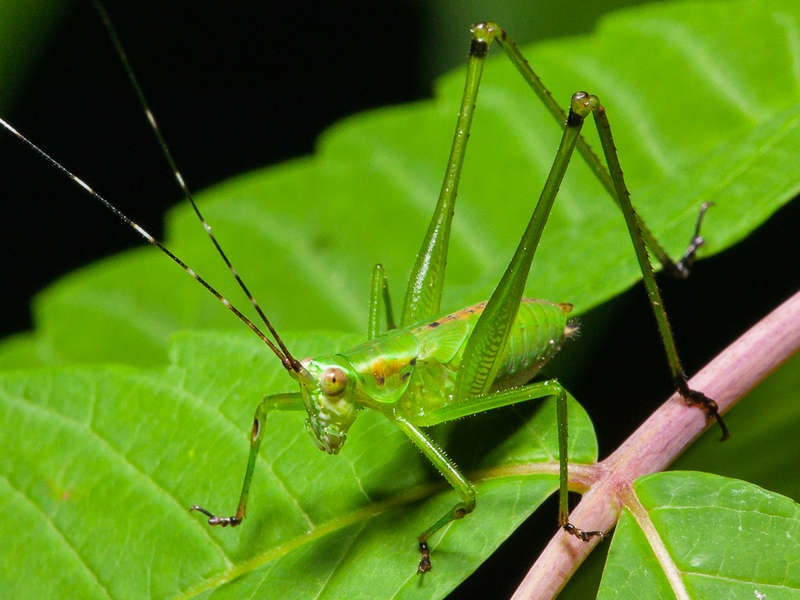 Not surprisingly, the round-headed katydids have rounded heads. 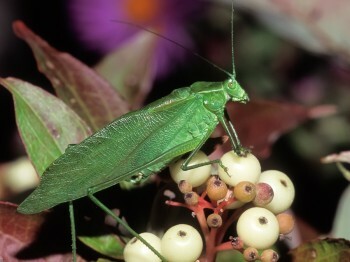 Most species are bright yellow-green in color, and some are decorated with a scattering of small dark spots as if someone sprinkled them with a dab of pepper. Delicate in appearance and full of personality, some make excellent pets. The songs of males range from simple swishy rattles or clicks to complex sequences of sounds. In fact, the song of the Common Virtuoso Katydid is one of the most complicated and outstanding of all our insect musicians. 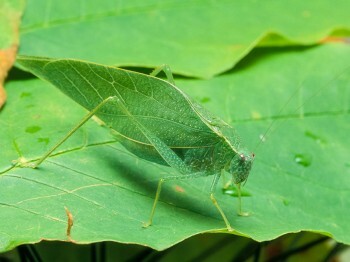 With intricately patterned ridges and veins on their angled forewings, the leaf green anglewings are unrivaled leaf mimics (see photo below). 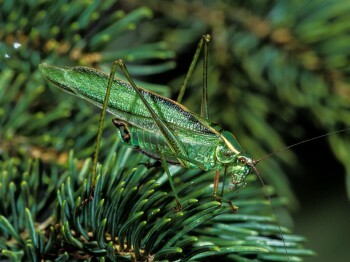 Anglewings are wide- spread and common in their preferred habitats but are difficult to track down because males typically give their ticks, zits, and rattles from high in trees. Instead, look for them on window screens and porches, drawn at night by the lights. A measured series of raspy high-pitched clicks or zits. 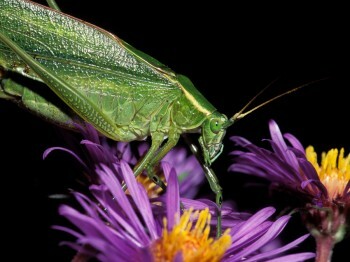 The most complex of all katydid songs! Very high pitched. A high-pitched swishy rattle heard at night. A brief, two-parted zeee-dik! Heard at night. A rapid series of ticks from high in trees at night. Brief raspy rattles in groups of two – three from trees at night. A series of quiet, lispy ticks from woodland understory. As a group, the bush katydids have angular features and are more slender and lean than our other katydids. 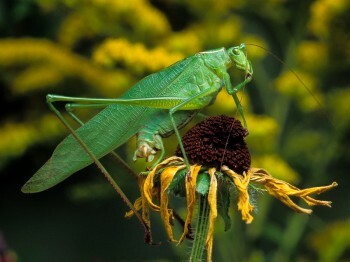 Many are quite elegant in appearance, arrayed in gorgeous shades of green and yellow. Found from forests to meadows, the males have songs that range from simple ticks or shuffles to pleasingly intricate sequences of buzzes. There is even one that appears to count when it sings. In most species, the males sing intermittently, and their sounds have a ventriloquial quality that makes them difficult to find. 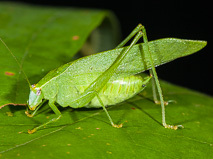 Bush katydids tend to look alike, and the key to identifying males by sight is the shape of their tail plates, as shown in the diagram at the bottom of this page. 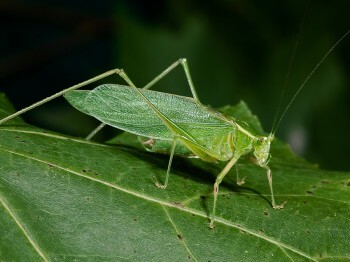 It is also notable that male bush katydids produce sperm packets that are accompanied by a large, edible gelatinous mass. 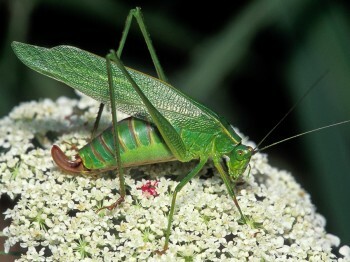 After mating, the female consumes this “nuptial meal” while the male’s sperm packet empties its contents into her spermatheca. The counting katydid. Adds one to three lisps with each song. Two – four raspy notes. Never counts higher than four. A single sharp tsip that may be given singly, or else in a series. 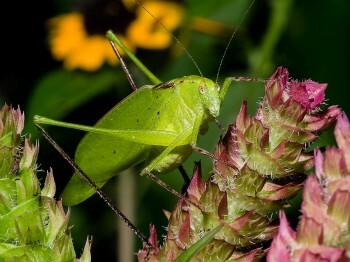 The most accomplished singer of the bush katydids. Different songs for day and night from weedy fields. Nearly identical to the Fork-tailed, simple tsips from trees. * Drawings from J. A. G. Rehn and M. Hebard. 1914. 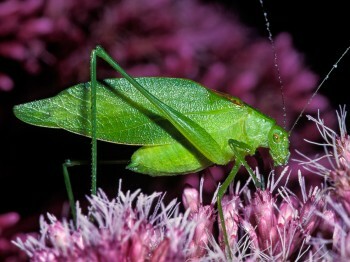 Studies in Tettigoniidae: 1. A synopsis of the species of the genus Scudderia. Trans. Am. Entomol. Soc. 40: 271-314.